Siriusly? We just bought a new car. A Ford Focus. It replaces our Ford F250 ten cylinder truck. Its sporty…almost too nice for me to drive. We love the 34 MPG verses the 10 MPG we were used to getting in the truck. So many new buttons and whistles. It came with a free three-month subscription to SiriusXM radio. Satellite radio with hundreds of entertainment options. Hip-hop, Rhythm and Blues, Rock, Pop, Christian, Dance and Electronic, Jazz, Classical, Kids, Politics, Traffic and Weather, Comedy, Latino, Religion, Sports, News and Public Radio and on and on and on. I recently had a chance to drive long enough to listen to many of these channels (my usual commute is ten minutes or less). I found out that satellite radio is a lot like cable TV…many options but, honestly, I only need TWO channels. Classic 70’s rock and Classic 80’s rock. Who’d want to change the channel when you can rock on down the highway to the Captain and Tennille’s “Love Can Keep Us Together”? Heh? Not this guy!! At $150 for a years subscription…we’ll pass, but thanks for asking. Finally a commercial bakery has captured the delicious taste of the hard and stony substance secreted by marine coelenterates as external skeletons into an individually wrapped in cellophane baked treat!!! CAN I HAVE ANOTHER CORAL CAKE MOM?! As a child did you have a cousin with a voracious appetite for Play Dough but could never prove that he was eating it? Well now you can!! 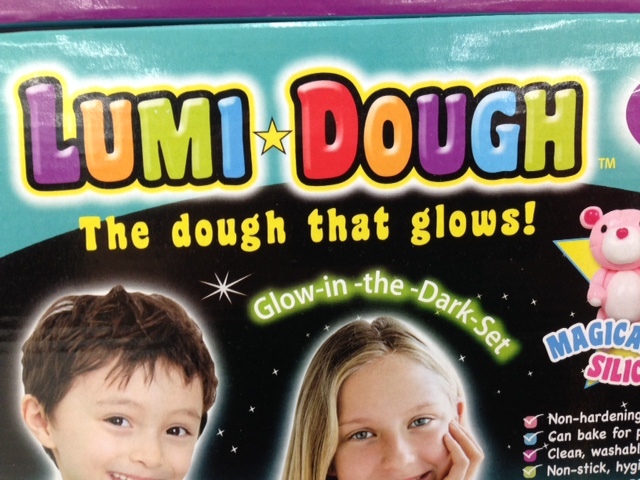 When your Lumi Dough starts to disappear just stick your suspected cousin into a darkened closet and BAM!! Mystery solved…or it could be your dog…if your dogs logs glow at night…there’s your sign. 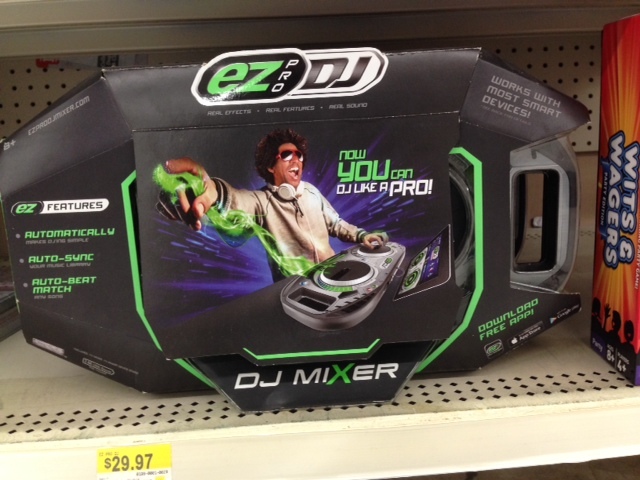 Yes…please…give your 8 year old a “starter DJ kit”. 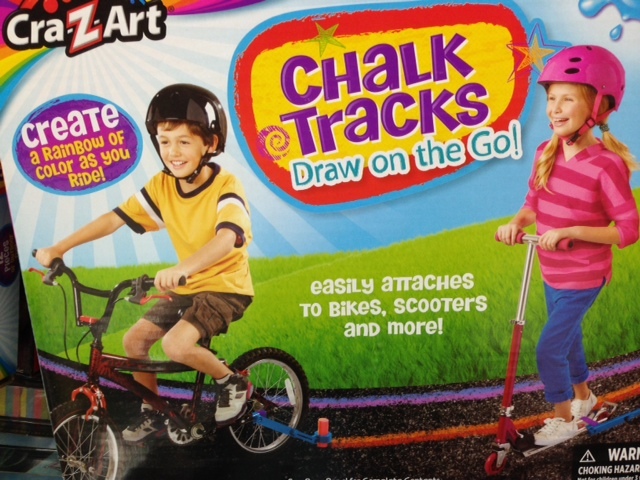 Whatever happened to kids riding bikes….? …get Junior one of these and he could start making some serious cash chalking newly blacktopped roads, streets and parking lots. 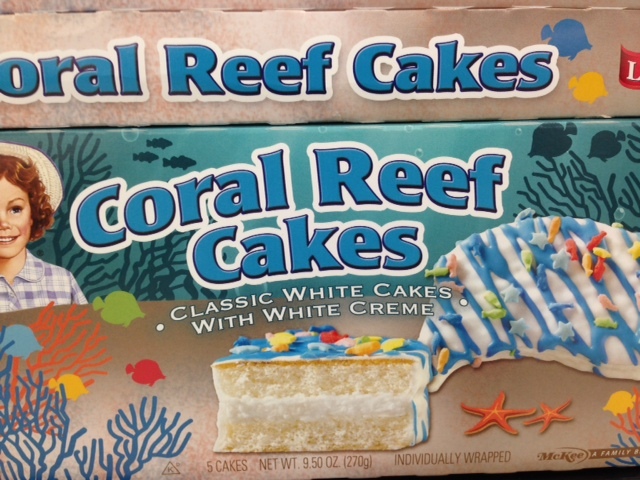 Those Coral Cakes don’t grow on trees!! And finally…I worked with an old baseball umpire last week as my partner. Umpires, as a whole, usually have several stories to share with whomever they’re working with that game. Honestly, several games have been delayed because the umpires were too entranced in each others stories to start the next inning. Umpires stories parallel those of fishermen, except that they’re usually telling something closely resembling the truth. The following is a pretty good story. It seems that this umpire was working a baseball game where one team was being thrashed by its opponent. THRASHED. The losing coach was fed up with his players and was making it a point to get thrown out (ejected). He hollered. He pouted. He gestured wildly. He was making a scene…all so that he’d get ejected and get to leave the ball park and go sit on the bus and not have to witness his teams ineptness that night. My partner walked over to the dugout, called the coach over to him and told him “Coach…I’m not going to toss you tonight. If I gotta stay out here and watch this then so do you.” With that my partner returned to his position and he didn’t hear anything else out of that coach for the rest of the night. Not. One. Peep. Have a great week. God bless! ← Under the water tower…. Like this post. You hit the nail on the head both with Sirius and Walmart. I had Sirius after the 6 months free. Then realized, Duhhh!, that I could just as easily play some of my many CDs and save myself $185 (yes, that’s what they wanted then). As for Walmart, they have everything at great prices…and…they provide decent pay and benefits to several family members so I don’t understand all the complaining. Great umpire story!!! Oh, BTW, I heard that a particular automaker will have 5 years of free Sirius starting with the 2015 models. Sounds great, eh? But I imagine it will somehow be reflected in the MSRP. Thanks!! My view on WalMart (or any other business for that matter) is if you don’t like it…don’t shop there. Through the years I’ve known several people who have worked at WalMart and its distribution warehouses…they’ve all enjoyed their time there, and continue to do so. Hubbs new Jeep came with Sirius (new a couplea years ago) – I enjoyed surfing the channels on a few road trips – him, not so much. *my surfing. Give that umpire a coral cake! What do you mean you had nothing to write about? Another thoroughly enjoyable post! Thanks for your funny and uplifting outlook. Thanks Michelle!! I appreciate your comments!